This feature should arrive for everyone when the next release of Windows 10, codenamed 19H1, is finished. It should be released sometime around April 2019. Paul Thurrott first noticed this change, and it’s something Microsoft didn’t mention in any Windows Insider blog posts. Of course, there’s a limit: You can only pause updates for seven days at a time. To do so, you’ll just head to Settings > Update & Security > Windows Update. 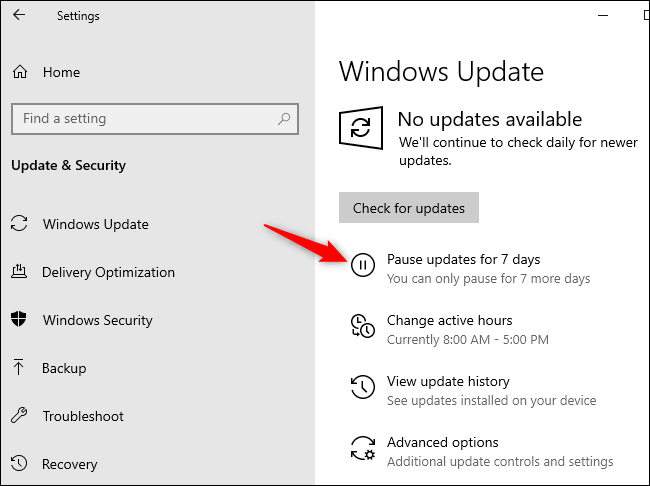 There’s now a “Pause Updates for 7 days” option here, and it works on Windows 10 Home. Windows 10 won’t install any updates while it’s paused. However, when you unpause updates—either when the seven day period expires or if you click the “Resume updates” button—Windows will immediately check for updates and install them. This isn’t a way to permanently avoid updates. You can only avoid them for seven days at a time, and then you have to update. But that’s still a huge improvement, and it means you can tell Windows not to bug you about updates for a while. If you’re on a trip or busy with something, you can get a respite from updates for up to a week. That’s huge! Windows 10 Professional users still have more control, including the ability to pause updates for up to 35 days instead of just seven and other options to delay feature and quality updates. But Windows 10 Home users finally have more control over updates, too.